How much to live "comfortably" in Los Angeles? The Standard of Moolah. 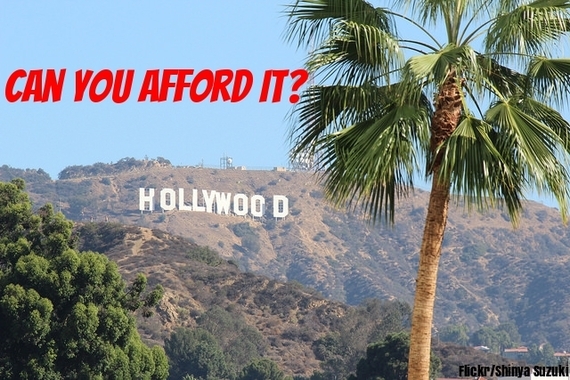 The Standard of Moolah in L.A. How much do you really need to live "comfortably" in LaLa Land? KID: "Daddy, are we rich?" FATHER: "Well son, let's just say we're comfortable." So how much dough a year do you think it takes to live comfortably in my hometown of Los Angeles, California? Since the notion of comfort is highly subjective and skewed by each individual's own circumstances - for some it means a roof over your head, for others it means a roof over your head in the Hollywood Hills plus another in Aspen - your educated guesses are sure to vary widely. I asked my friends on Facebook what they thought it would take and their answers ranged from an annual low of $45,000 to a high of around $300,000 to be "comfortable" here in Los Angeles. The numbers went up from there for those who wanted to do things like buy a single family home in a 'good area', go all out and lead the 'good life' or educate their offspring at a 'good school'. In other words, in L.A. it's all about good. The website Gobankingrates.com jumped in and did the math for us in their piece, "How Much Money You Need to Live Comfortably in the 50 Biggest Cities". They calculated an annual income of $74,371 was about right for the average person to live comfortably in Los Angeles. This is all fine and dandy until you look at what things really cost and note that the median income in the Southland is merely $48,682. I couldn't stop thinking about this and have come up with the most relevant FAQs for those of you who can't stop thinking about it either. Short answer: They used the 50-30-20 rule of personal budgeting (50% of your income goes to basic housing and food, 30% goes towards "discretionary" spending - basically anything fun like going out - and the last 20% goes to savings.) Are you with me so far or did I stump you on with the 20% savings figure? What does $75k a year buy you in terms of comfort here in LA? If you're happy with renting a 1-bedroom in the city, buying your basics at Costco, not paying too much for transportation in your mid-range automobile (or better yet learning to navigate our embryonic public transportation system), and carrying a not-so-fancy insurance plan, you'll be sitting pretty. Ok pretty might be strong, apparently you will be "comfortable." Are L.A. people really so skewed (and screwed) when it comes to income? There are tons of people who would literally starve on the $75,000 per year here. (And I'm not talking the Beverly Hills diet of starving on purpose.) In reality, the median income for Los Angeles is "just" $49,682. TRANSLATION: There is a $25,000 gap between what the median person makes and what it "takes" to live comfortably in Los Angeles on average. That $25,000 gap (and for millions of citizens, it's much larger than that) means many people are probably not living very comfortably in the City of Angels at the moment. The average rent for a 1-bedroom in L.A. today sits at around $2296 per month. *** Obviously some people are paying way less while others are paying way more. But to put that in perspective, I have clients in other parts of the country who are building a custom home and even with their mortgage, taxes and insurance, they're still shelling out $500 less per month than the average 1-bedroom rentals of my So Cal compatriots. How are Southlanders balancing their budgets? Short answer: Most are not and are not even close. Here's where financial security gets killed. I'd be willing to bet diamonds to donuts that most people in L.A. are not saving 20% of their incomes. Plus, many are dealing with credit card debt on top of car notes, student loans and the siren's call of just one more round of Botox. How do I get my financial act together? Whether you live in Los Angeles, California or Los Angeles, Texas (yes, there is one), here are a few ways to get your financial house in order so you can get on track to build wealth and achieve financial independence. •	Look for ways to drop your housing costs. A roommate, different location or Airbnbing can save or make you thousands of dollars per year. It doesn't have to be forever but a few years of slight inconvenience could put your finances in the black. •	Make smart decisions with your transportation. L.A. is all about the car, but you really look lame if you drive that fancy tricked out BMW but can't afford the gasoline, let alone insurance. Besides, think how good your backside would look if you bicycled everywhere. •	Make a point to avoid the death trap of credit card debt. It will spiral out of control faster than you can order a margarita. •	Whether are making the big bucks or just scraping by, make a point to pay yourself first. Paying yourself first means regularly socking away a sum for the future. It may not be as immediately glamorous as other uses of your money, but nothing feels as good as knowing you are secure financially and don't have to worry about your rent check bouncing. Remember that 50-30-20 I mentioned at the top of this piece? Either way the suggested budget includes a 20% savings rate. What do you think my fellow Angelinos? Could you live comfortably on $75,000 per year anywhere in Los Angeles? Are you spending more than you should? Can you strategize ways to get by on less so that you can save substantially more? Here's where the tough love comes in and it's an issue that New Yorkers deal with all the time too. Are you really getting your money's worth by living here? If you LOVE the city, EMBRACE the city, TAKE ADVANTAGE of the city and are SEEKING YOUR FORTUNE here, then the high dollar costs and emotional investment are worth it. But if you don't or aren't, there are (literally) greener pastures elsewhere where your dollar buys substantially more including (literally) green pastures. I, for one, am in love with the place and despite my grumbles am happy to fork over every red cent it costs to live here. Of course I've worked my bootie off to make sure I can live very comfortably here in LA. Viva Los Angeles! DAVID RAE, CFP®, AIF® is a Los Angeles-based Wealth Manager with Trilogy Financial Services, a regular contributor to the Advocate Magazine, and author of the FinancialPlannerLA.com Blog. He lives in the Beverly Grove neighborhood with his husband and their 2 chihuahuas. Follow him on Facebook or via his website, www.davidraefp.com. Article was originally published on the FinancialPlannerLA.com blog. Securities and advisory services offered through National Planning Corporation (NPC), Member FINRA/SIPC, a Registered Investment Adviser. Additional advisory services offered through Trilogy Capital, a Registered Investment Adviser. Trilogy Capital and NPC are separate and unrelated companies. **Methodology: GOBankingRates surveyed monthly living expenses in the 50 most populous U.S. cities according to U.S. Census Bureau estimates. This cost-of-living comparison included the following factors for a single person: (1) housing, using the median rent for a one-bedroom apartment in each city, sourced from Zillow's January 2016 rental index; (2) groceries, using the recommended amount reported by cost-of-living database Numbeo.com for each city, sourced March 9, 2016; (3) utilities for a 915-square-foot apartment in each city, according to cost estimates from Numbeo.com, sourced March 9, 2016; (4) transportation costs according to the Economic Policy Institute's Family Budget Calculator for each city or its nearest metropolitan area; and (5) health insurance premiums as estimated at the state level for 2013 by the Kaiser Family Foundation.